A delicious and nutritious meal in a shake. Personalised Protein Powder provides the flexibility to meet your protein needs and gives you sustained energy between meals. Scientifically formulated multivitamin ensures you receive the essential nutrients daily. Fibre to help flush out toxins and wastes. Keeps you going for longer! Losing weight doesn’t get any easier! Delicious and nutritious shakes with all the goodness of a well-balanced meal. A high quality multivitamin supplement to ensure you get all the essential vitamins, minerals and nutrients you need. With minerals and herbs which helps ensure optimal intake. Our proprietary blend of high quality soy and whey protein, which can be added to your shakes in varying amounts, to help you meet your daily protein needs. 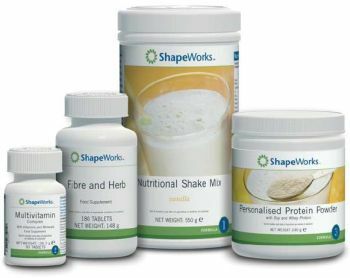 A supplement which has been specially designed to aid safe and effective weight control, by providing an increased amount of dietary fibre, hereby reducing the amount of time food stays in the body and so assisting in the removal of toxins and wastes. Herbalife QuickStart Pack - Choose the Formula 1 Nutritional Shake Mix flavour you prefer: Vanilla, Chocolate, Strawberry, Tropical Fruit, Cappuccino and Cookies & Cream. For extra weight-loss help, add any of our weight loss enhancers that target key dieting challenges. The Quick Start Pack comes complete with a customer guide (usage instructions, meal planners and lots of recipes to try). And you will receive a personalised programme from Herbal Vitality by email. And NEW "Tips by Email" provided by Herbal Vitality with tips at different stages of the programme i.e. day 4, day 7 etc. Additional Information: Guide to the Herbalife Diet and question and answer and how to make a great shake? Click here for protein snacks and enhancers.